Do you suffer from allergies? If so, don’t miss out on a rebate offer from McNeil Consumer Healthcare. Get a $20 Visa Gift Card (while supplies last) when you purchase (3) or more participating products during the same shopping trip on (1) receipt. Do note that you will need to purchase at least (2) “Treat products” and (1) “Soothe product” to earn the gift card. They also need to be on the same receipt. 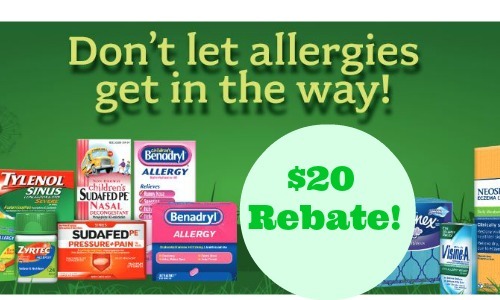 This can be a HUGE Money maker right now with awesome deals on Benadryl at Publix and Harris Teeter! Allow (3) weeks to receive your gift card once your information is submitted. Get Back: $20 Visa Gift Card! !